Beat together cream cheese and butter until smooth. Add bacon and green onions, mixing until thoroughly blended. Shape into a log about 8-inches long, cover and refrigerate overnight. 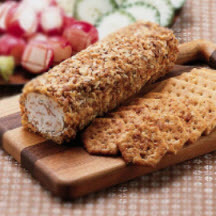 Coat log with cheese spread. Roll in pecans and garnish with snipped parsley. Chill.